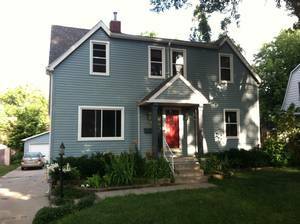 Don't miss this charming 3 bedroom, 2-story home located in a family friendly Des Moines neighborhood. You'll love the mature trees and convenient location close to the restaurants. The open living room with original hardwood floors and large windows welcomes you to the home. An arched entry leads you into the dining area, one of your bathrooms and flows right into your kitchen (all appliances stay.). On the upper level, you'll discover an oversized master bedroom and a loft area great for an office or reading area. The upper level also includes an additional bedrooms and a full bath. All bedrooms are carpeted but there's original hardwood beneath the carpet. The finished lower level includes the laundry, a living room and a non-conforming 4th bedroom with a full bath. There is also plenty of space for storage. The washer and dryer are included with the home. Outside you'll find a good-sized yard with a wood privacy fence and mature trees. There's also a 2-car detached garage. Some updates include: windows in 2011, roof in 2014, HVAC in 2005, New sewer line in 2013 and new carpet. As an added benefit this is in an NFC area which means you qualify for a $01,000 forgivable grant and up to $2500 in closing costs. Don’t miss this one Call Brook Doheny today 515-314-0647!